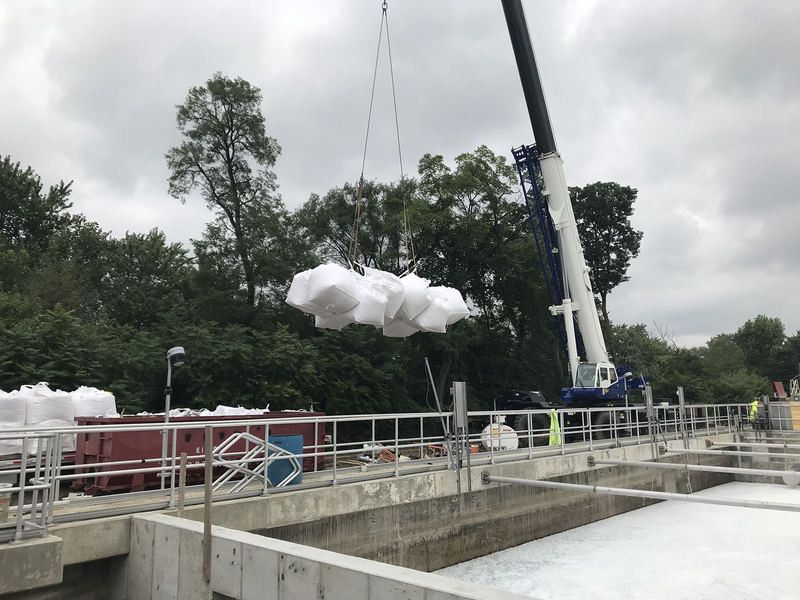 CTI Engineers, Inc., in conjunction with O’Brien and Gere, has designed the first Integrated Fixed-Film Activated Sludge (IFAS) treatment system in Ohio, with full scale performance testing of the completed system currently underway. The IFAS system is a suspended growth process incorporating an attached growth media within a suspended growth reactor. 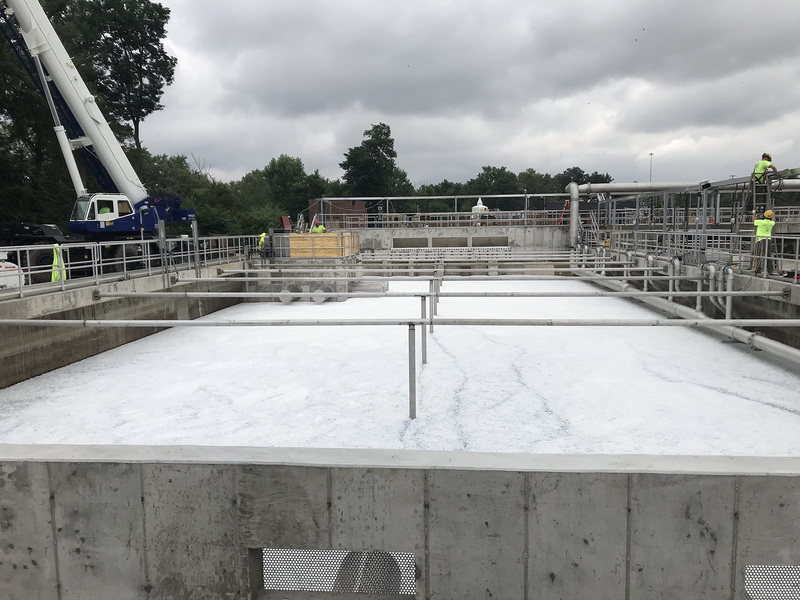 This technology facilitates the creation of additional biomass within the treatment facility to meet more stringent effluent standards and increased volume of loading, without increasing or adding tank capacity. In Massillon’s case, this system was chosen to enable biological nutrient removal (BNR) and reduce the need for chemical precipitation. By expediting the project design and taking advantage of Ohio Environmental Protection Agency’s Harmful Algae Bloom (HAB) loan opportunity for phosphorous reducing projects, CTI assisted the City in procuring a 0% loan for the portions of the project attributable to phosphorous removal, which resulted in an overall reduction in interest rates for the project of from 2.14% to 0.32%. This amounted to a savings of approximately $7 million over the life of the loan. The City of Massillon WWTP is a tertiary treatment plant that had initial limitations based on a flow of 15.8 million gallons per day (MGD). Under those initial limits, the plant was designed to meet monthly effluent permit limits of 10/22mg/L BOD (summer/winter), 12 mg/L TSS (all year), and 1.4 mg/L NH3-N (summer only), with no phosphorus limit. Following new regulations from the Ohio EPA and the Tuscarawas River Total Maximum Daily Load (TMDL) report, the plant was required to upgrade its existing liquid and solids handling treatment facilities to meet weekly (89.7 kg/day) final effluent limits for Total Phosphorus (TP). Facilities Planning also recommended expansion of the plant’s existing 15.8 MGD rating to 17 MGD to account for future growth. At 17 MGD, weekly (89.7 kg/day) and monthly (59.8 kg/day) final effluent loads correspond to concentrations of 1.4 mg/L weekly TP and 0.9 mg/L monthly effluent TP concentration limits. The Facility Plan also recommended upgrading the plant to meet a monthly Total Nitrogen (TN) limit of 10 mg/L at the expanded 17 MGD flow, based on preliminary Ohio EPA nutrient removal actions and discussions with City staff. To achieve capacity expansion and BNR, the Facility Plan and associated TP Removal Study recommended retrofitting the existing biological process to an IFAS system. Ready to see what CTI Engineers can do for you? Contact us today to discuss how we can apply Practical Innovation, By Design® in your community!